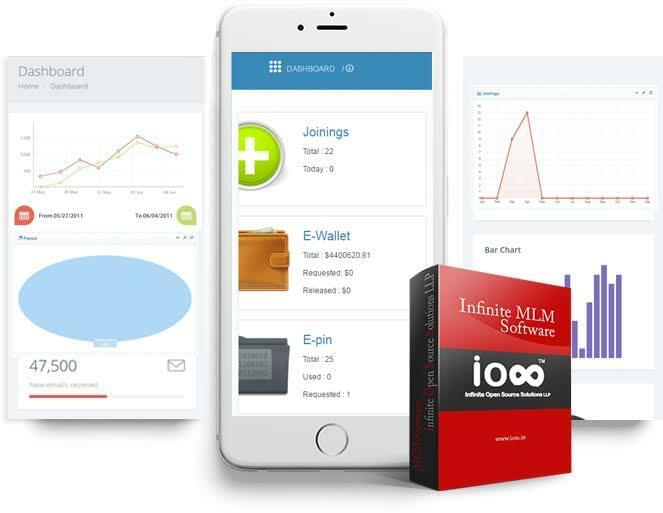 Infinite MLM by IOSS is an online Network Marketing Software that offers many high-end features to MLM businesses including e-pin, e-wallet, e-commerce integration, open cart integration, and more. MLM compensation plans such as Binary, Matrix, Unilevel, Board, Generation, Party, Gift, Monoline, and more are easily deployable through Infinite’s customization features. Infinite includes multicurrency and multi-language capabilities. Infinite optimizes for all devices including smartphones, tablets, desktops, and all platforms, including Android, iOS, Windows. Infinite offers personal self-replicating web sites for each member, with a static, search engine friendly URL. Virtually any website is supported and can be managed. Many web designs are offered, ensuring the most suitable design for each specific business. Payment transactions are managed using E-Wallet and E-Pin and an integrated customizable, web-based shopping cart solution makes it easy for users to manage the process. Payment gateway methods are integrated for ease of accepting credit and debit cards. Inventory software is integrated to allow for management of stock, sales, and supply. A backup system ensures your information is safe. Infinite offers automated SMS integration so users can stay informed on all aspects of their business and communicate with their downlines and customers and keep them up-to-date. Infinite also offers an integrated, centralized support system which allows business to handle support requests and handle them based on priority. Other integrations include Content Management Systems (CMS) that allow for adding, updating, and deleting content as needed. Franchise management is included as well as a comprehensive reporting feature that allows reports to be exported in a variety of forms, including Excel, PDF, and .csv. Still not sure Infinite MLM by IOSS is right for you? Use our Product Selection Tool to compare other MLM solutions. Have questions? Call one of our unbiased Technology Advisors for a free consultation. Learn everything you need to know about Infinite MLM by IOSS. Our experts will reach out to you shortly.